Excerpts: When 23 June comes, the fundamental judgement for Britain is “do we believe it is possible to run a single currency without a single country. Do we want to be part of that single currency and single country?” If we vote to remain we will be sucked irrevocably into both. No country has frequent referendums on one subject. After all, our last one on Europe was in 1975. Eurozone leaders will at some stage be faced with a decision to transfer political sovereignty to a European government that can support and sustain the euro currency. That government will insist on a united foreign and defence policy. There will be no vetos as there are no vetos in any national government. If we have left the EU that presents no problem. If we remain in, we should not try to block its development. It will be argued that the Eurozone countries cannot yet take such a profound political step. The democratic support of its citizens is not there. I personally do not think it is possible for all seventeen Eurozone countries to live within such a financially disciplined structure. That will need to be determined by the nature and depth of the design changes that the transfer countries (Germany and the Netherlands) insist are introduced. All the signs are that if the Eurozone is unable to make that decision soon then their leaders will be faced by an urgent and even deeper Eurozone crisis. When – it is impossible to determine. If there is no chance of a democratic will emerging in the next few years to integrate then the euro currency should be wound down to at least a very small grouping whose economies are closely linked to the Federal Republic of Germany. Anything else is damaging to the standards of living, not just of most of the citizens of Europe but of many in the global economy as all these issues interact. I can think of no more irresponsible decision if one is convinced, as I am, that another Eurozone crisis is inevitable for the UK to hang around within the European Union, even though we are not in the euro, merely waiting for that crisis to happen. The Eurozone is economically stagnant. Not just suffering from appallingly high unemployment but already a dysfunctional Union. It is essential that Britain in leaving the EU has the courage, the imagination and the flair to find new global markets, become more competitive with even better design and quality than hitherto. We can start on that reorientation during the Treaties’ agreed transitional period towards a more global economy. I do not pretend that it will be easy but it is within our capabilities. We are not just a nation of shopkeepers but a people with an entrepreneurial spirit. By and large our smaller businesses are finding winning global markets easier than our larger ones who seek comfort in the lobbying business in and around Brussels. Just as in 2005 when the Dutch voted down Giscard d’Estaing’s Constitutional Treaty, they have now blocked ratification of the EU-Ukraine Association Agreement. No-one, not even the Prime Minister, can say that the Dutch vote is anti-European. It is anti the dysfunctional EU that is dragging Europe down in its economic performance and its foreign and security policy. The French will be even more reluctant to risk a referendum to reform the euro and so the euro crisis will go on, reform will be shelved, relative stagnation continue. The case for a new start for Britain grows stronger by the day. The Dutch vote should encourage voters in the UK to vote to leave in our referendum. There is another Europe that is starting to emerge and it is one which the UK can work happily with. Excerpts: The EU/Eurozone from 1992, in marked contrast to the old European Community of 1975, creeps into every nook and cranny of our life. It is now becoming entrenched in the NHS and this June we have a once-in-a-lifetime opportunity to get it out. As if recognising the truth of this interpretation on 13 December 2007, with not much publicity, the Department of Health issued a document titled Principles and Rules for Cooperation and Competition, running through which are EU legal positions which have become the law that operates in the UK. The advisory Co-operation and Competition Panel was reported in the Financial Times to have been applying its interpretation of the law since 2009 – by advising on NHS mergers and handling complaints about anti-competitive practices by hospitals and primary care trusts. In truth, since 2002 the Labour government, the Coalition government and now the Conservative government have accepted an EU market in health. … We are agreed in Vote Leave, that whatever our political views on the present marketization of the NHS, decisions on the NHS should for the future be for the UK Parliament and devolved administrations to take. It should not be for the European Commission nor the European Parliament. Financial Times, 27 and 29 July 2011. We have a once-in-a-lifetime opportunity to leave in an orderly way ….under a government which has four years to run. Lord Owen speaking today, 22 March 2016. “Ed Miliband refused a referendum in the last election and it cost him many votes and a crucial number of seats [see Annex A]. He is a sincere and very committed European but it is important to recall that since 1962, under Hugh Gaitskell, the Labour Party has been every bit as strong an anti-federalist political party as the Conservative Party. 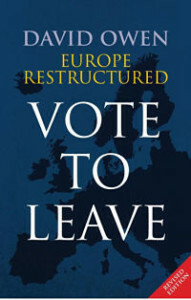 The Labour Cabinet in July 1977 under James Callaghan actually defined the UK position as ‘Yes’ to Britain’s continued and constructive membership, but specifically ‘No’ to the integrationist wish eventually for a single state a United States of Europe. The EU’s Hubris has brought its own Nemesis. Lord Owen addressing the Hellenic Psychiatric Association. London, 18 March 2016. “A currency needs a country. A country needs its defined borders and ability to control who comes over those borders. In the 1960s we in the UK handled the Kenyan Asian influx and in the early 1970s the Ugandan Asian influx. It was not easy but the country rallied around under first Labour and then Conservative governments. Today, our Prime Minister pretends we are not involved in the humanitarian disaster unfolding in Greece, that being outside Schengen protects us. Immigration in the UK stems mainly from automatic EU rules. Our Prime Minister has supported an agreement which is being presented to the Turkish people as speeding up entry into the EU. Yet before the ink is dry on any wording, we know it is a promise that is not going to be honoured. That is no way for Britain to behave. Better tell the truth and not feed disillusionment in Turkey, an important NATO ally, later. Our problem is that immigration is far higher than the government will admit. It is creating far more strains and stresses in our national health service, our social services, our housing and our schools, than anyone is prepared to openly acknowledge. If we could slow the automatic immigration from EU countries into the UK then we would be able to use some of the freedom to manoeuvre to alleviate the human grief that is unfolding in the camps in Greece. It needs to be said quite clearly that as from the 23 June if we gain control of immigration we will have the freedom to choose. We will be able to debate the situation in Greece in Parliament and take our own democratic decisions. We could decide – and I think we would – to slow immigration from EU countries where there are no good proven economic reasons for it, and as world citizens shoulder some of the responsibility to alleviate the hardship in some of the migrant camps in Greece where Syrians have fled from towns and cities known to be the subject of an horrendous civil war. We are locked in today to a rigid box which inhibits our humane response. We would become, after leaving the EU, a more humane country. We would have a more flexible immigration policy able to admit to our country people from India or Australia who can demonstrate that they will add to our economic growth and financial stability because of their skills. The EU deal with Turkey is fraught with dangers. Lord Owen writing in The Telegraph, 17 March 2016.